Rudy Migdael Ramirez in Jutiapa, Guatemala. Rudy Migdael Ramirez, 36, is one of those parents. He opens the chain-link lock to his concrete house outside the town of Jutiapa in southern Guatemala to show NPR around. "This is my son Rudy Jr.'s room, there's his bicycle and all his toys," Ramirez says of his 9-year-old. Asked why the boy doesn't have a bed in his room, he says, it's next door in his and his wife's room. They've always all slept in the same room, he says, not wanted to be apart, even for just a few hours. Ramirez's hazel eyes are red and swollen. "I just want them back here, with all of us sleeping together again. That's what I ask God for. Every night I ask God for mercy," he says, overcome with tears as he pauses. "It's so painful not to have my son here, not to have my wife," he cries. Ramirez says in early May, while they were in Guatemala, he and his wife began getting threatening phone calls from unknown people. "First they called her phone, saying they were going to kill her. Then they called mine and said they would kill all of us," he says. Ramirez reported the calls to the police. It's not uncommon for gangs to extort and threaten residents in Jutiapa, say local residents. The calls didn't stop, so Ramirez says his family fled north, traveling through Mexico to the United States border. On June 8, he says, the family was attempting to cross into Texas, but somehow he and his son got separated from his wife. Soon he and Rudy Jr. were picked up by U.S. Border Patrol agents. Ramirez says he told them about the threats. "They told me, 'why don't you apply for asylum in Mexico or Argentina, anywhere but here,' " says Ramirez. The following day, around 2 in the morning, the guards came for Rudy Jr. Ramirez says his son cried and cried, and he tried to comfort him, telling him he wouldn't go back to Guatemala without him. Rudy Jr. was sent to a shelter in New York City. Ramirez says the officer gave him a bunch of papers to sign. "I asked them if they were for my deportation, and they just laughed at me," he says. He tried to show the officers the Guatemalan police forms he was carrying documenting the death threats. But according to Ramirez, the officer told him that the documents were not valid in the U.S. and that his son would be on the plane with him once he was deported. Rudy Jr. wasn't on the plane. That was June 14. Ramirez hasn't seen his son. Nor has the boy's mother. She crossed into the U.S. a few days after her husband and son, hoping to reunite with them. She turned herself in to the Border Patrol. She's been in detention in Texas ever since. Jodi Goodwin, her lawyer, says the mother is distraught. "Oh my God, she is beside herself. She is deathly terrified that she might get deported and [Rudy Jr.] he might get stuck here and they will give her son to somebody else," says Goodwin. On Thursday, the Trump administration said it has reunited 364 immigrant children with their families after they were separated at the border, but hundreds of minors still remain separated ahead of the July 26 deadline. Goodwin says it's unclear whether or how reunification will extend to parents already deported. Immigration and Customs Enforcement did not return requests for information about deported parents and how they will be reunited, nor about the Ramirez family's case. NPR could not independently confirm their story. In the family's Guatemalan home town, the waiting has been excruciating. 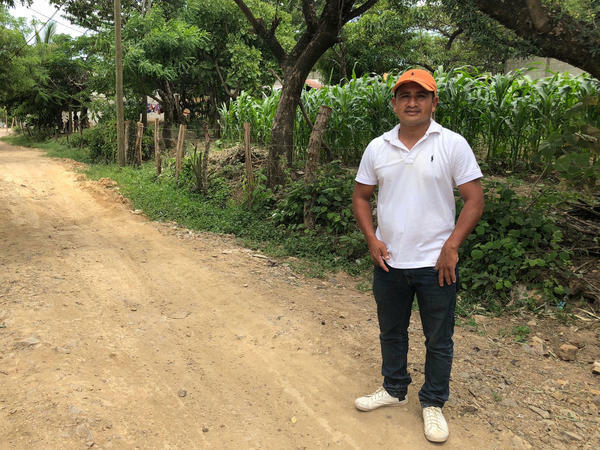 In a sparse office overlooking Jutiapa's main plaza, Oscar Folgar, an official at Guatemala's Foreign Ministry, sees many parents going through what the Ramirez's are experiencing. "At least 40 parents have been returned here and are waiting for their children to come back," says Folgar. He says he does his best to try to help them locate their loved ones and give them updates on when they will return. María Mendez Ramirez, the father's 62-year-old mother, hopes that day is soon. "It's been two months, nearly two months since I've seen my baby," she says sobbing. She says she doesn't wish this anguish on any parent, or grandparent, and urges those leaving Jutiapa for the U.S. to reconsider their decision. This week, Ramirez got word that his wife could soon be released. As of Friday morning, she was still in detention waiting for Rudy Jr. to arrive from the shelter in New York. Relatives of the father in Guatemala said he was briefly hospitalized Thursday with symptoms of anxiety and unstable blood pressure. NPR international correspondent Carrie Kahn reported in Jutiapa, Guatemala.